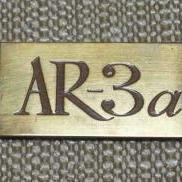 I believe that the AR-4x schematic that has been floating around both here and on AK may be inaccurate. I believe the colors on the tweeter leads are reversed which would result in reversed polarity on the tweeter. I've come to this conclusion by observing the attached picture. As you can see, the lead from the base is green. This contradicts the schematic. You'll also note that two leads running to pin 2 on the rheostat are green and yellow. Per the schematic, they would both be green. Now there is one unknown... whether the speaker in the attached has been modified and is itself, incorrect. Unfortunately, I did not take a picture of the innards of my 4x so I have nothing to compare against. What is important is the phase relation between the two drivers and their matching speaker. The positive terminal of the woofer (red dot or cross) should connect to the #2 speaker input terminal. 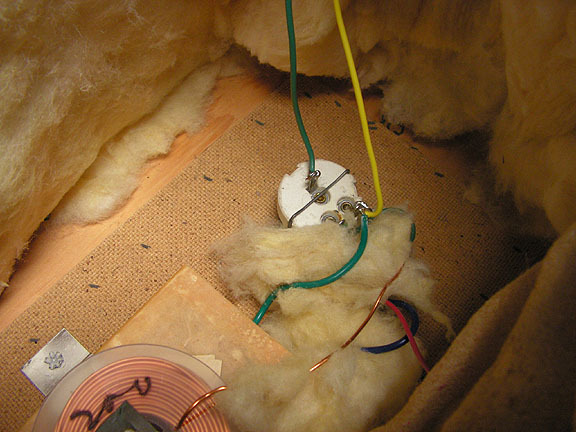 #1 terminal of the potentiometer should connect to the #1 speaker input terminal (common or negative side). #2 terminal of the potentiometer should connect to the capacitor and one side of the tweeter. You're a saint. This is why I prefer schematics over pictures. Had I more than one to reference I wouldn't have questioned the validity of this one. For one more reference, this thread on AudioKarma includes a detailed analysis of the AR-4x crossover, and tweeter repsonse. I opened up an AR4x which, I believe was untouched since its creation. It's serial number: 84366 (1966, I believe). The crossover I opened up was the same as the picture EXCEPT the yellow wire running to the tweeter was on the level control's base, and conversely both wires running to terminal 2 on the level control were green. I understand that AR changed it's crossover design a few times and one of those changes was to run the tweeters out of phase with the woofers. Rumor or truth, I know not. All I know is that my speakers were apparently congruent with the crossover schematic posted above, not the photo.